Informal group for Canadian Watercolour Artists (yes we spell it with a “u”!!). 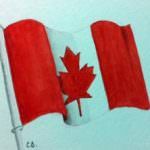 Bienvenue à tous et toutes les aquarellistes canadiens/canadiennes ! Trying to see whether there is a Canadian charity with a tax deductible receipt for Canadisn income tax for World Watercolour Month. No tax deduction for Canadians for a donation to a US foundation. Beautifully detailed and wonderful colours!